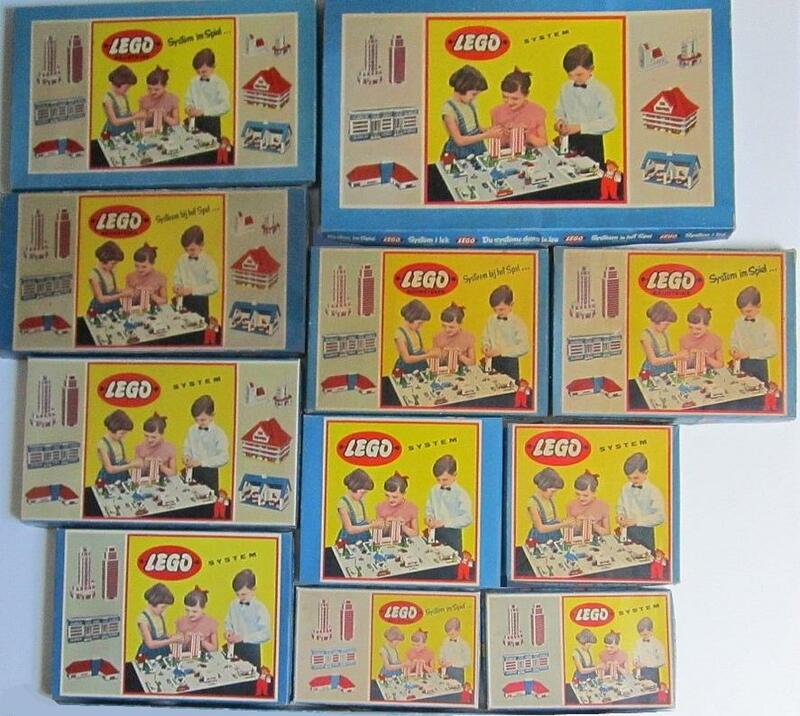 Anyone who has ever seen old LEGO catalogs has probably wondered... "gee how simple collecting early LEGO must be"... well nothing could be further from the truth... LEGO sets from the 1955-72 era (especially 1955-65) are extremely complex.... and I often call that era the "LEGO Mayhem" era, due to the extremely hard to understand the nature of old sets. 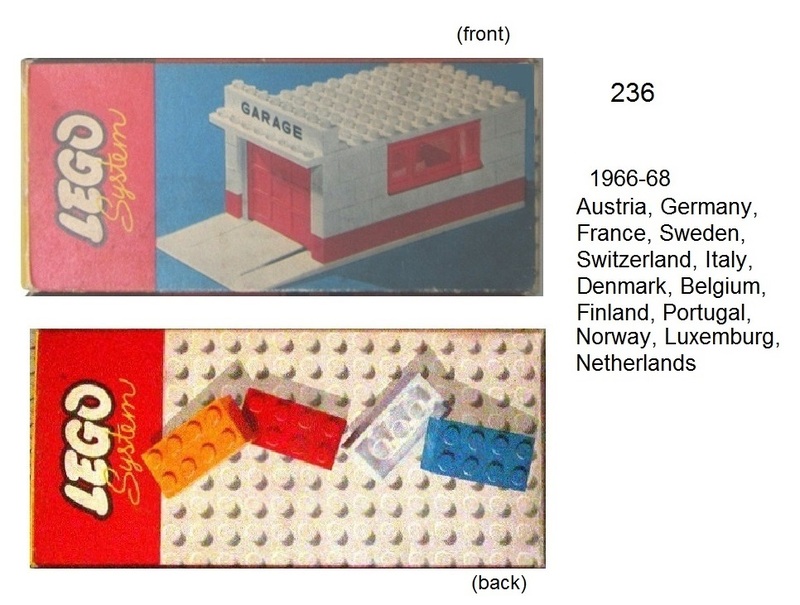 For example (I'll give several, but only 1 today)... the 236 Garage Set (numbered 1236 in Denmark, Norway and Sweden from 1955-58)... was produced from 1955-70. And during that time, it was made in a very large and confusing number of box styles, contents, as well as garage door and window styles. 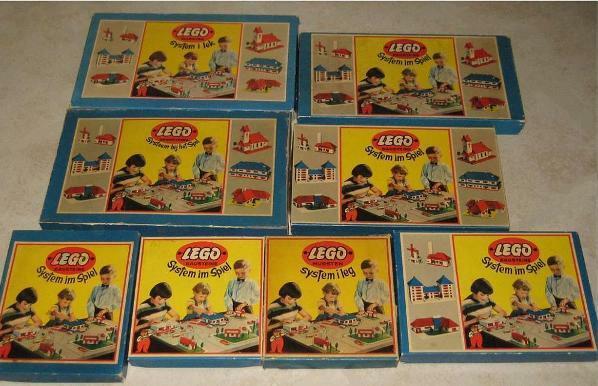 While part of continental Europe was selling this flat box variety... the other European countries continued selling a rectangular loose box variety... in a new box design... and also using the 236 number... what's odd is that the back of the box prints "LEGO System of Play" in languages that this box type was never sold in, including English!! As Mr Dos Equis would say "stay strong my friend." Wow! Thus is enough to make your head spin, and we have not even opened the box...yet! 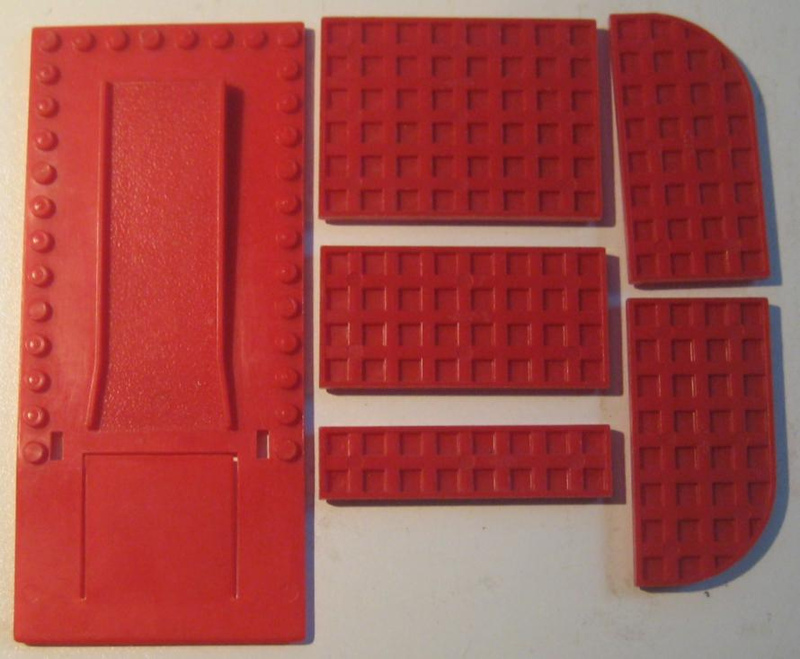 I've heard the red version of the ramp/base in that set is extremely rare. Germany, Austria, Sweden, Switzerland and France continued to have the loose part rectangular box version of 236... but in 1960 all the other countries of Europe... with the addition of Britain, Ireland and (in 1962) Australia... started using this new style box version of the flat box 236. 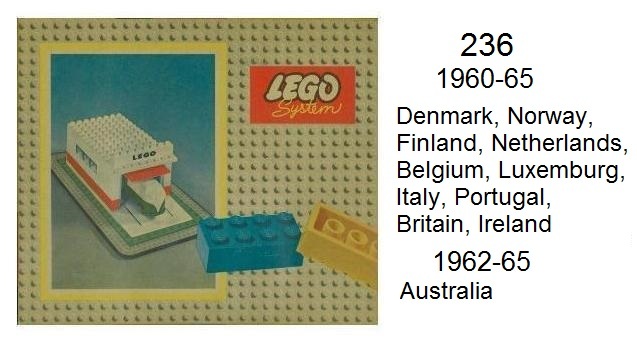 In 1966 all of (flat box 236) continental Europe switched over to the (my previous post) rectangular box 236... but Britain, Ireland and Australia discontinued sales of the 236. I'm repeating this image again... since I posted it out of order... but in 1966 all of continental Europe discontinued using the (labor intensive to pack) flat box version of 236... and started using the already used (in Austria, Germany, Switzerland, Sweden and France)... rectangular box 236 set. OK... now the 236/1236 went thru 8 different box styles during the 16 year run of the set... but there were many other changes. 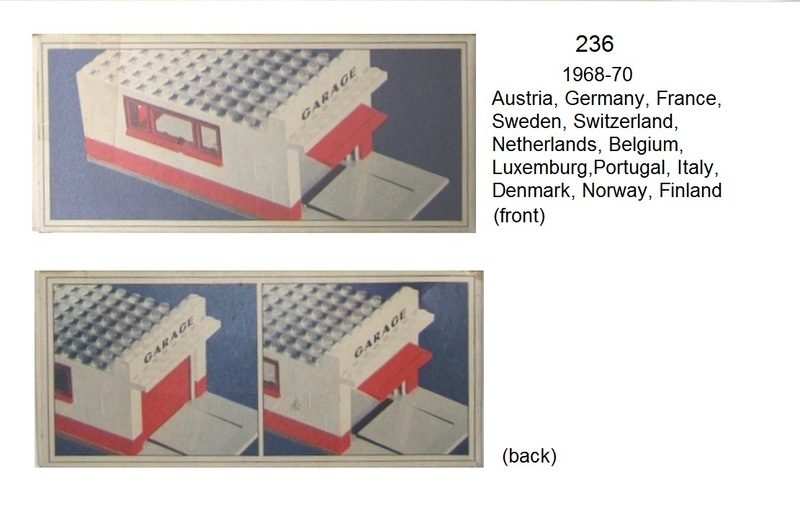 Early 1955-56 1236 models (in Denmark, Norway and Sweden) sometimes had rare red garage baseplates... or even roof plates (two 6x8 and one 2x8 red waffle bottom plates). 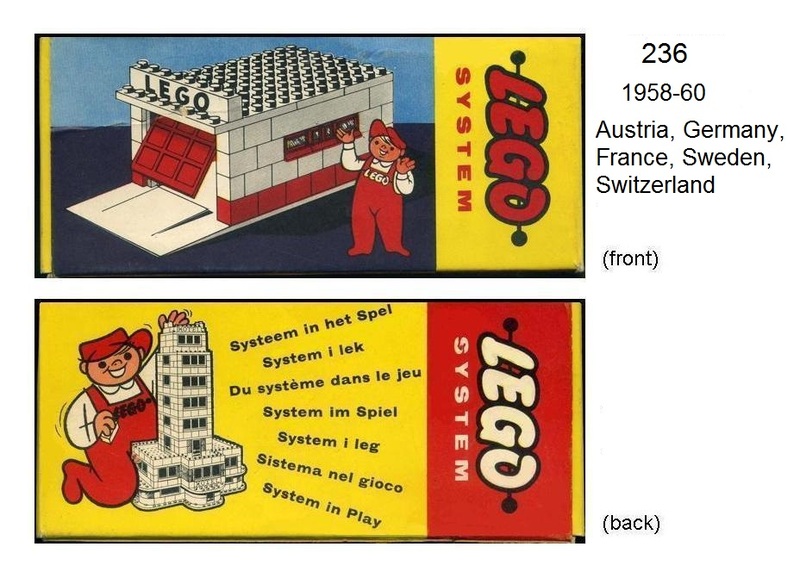 What a fun LEGO history post! Even by 1956 when the slotted bricks were retired... TLG had a lot of the earlier garage door frames left over with "wings" to fit into the slotted bricks. 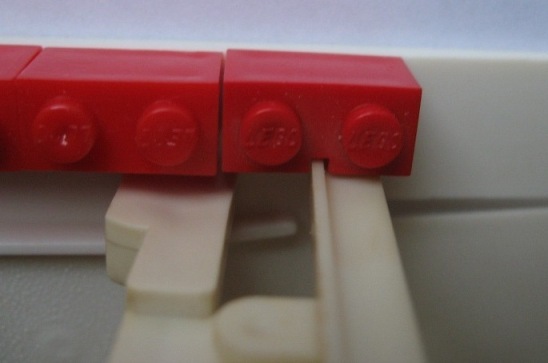 So TLG decided to provide only enough of the slotted bricks to hold the door frame in place (see the blue background image).... and the rest of the bricks were regular hollow bottom LEGO bricks (1956-58). 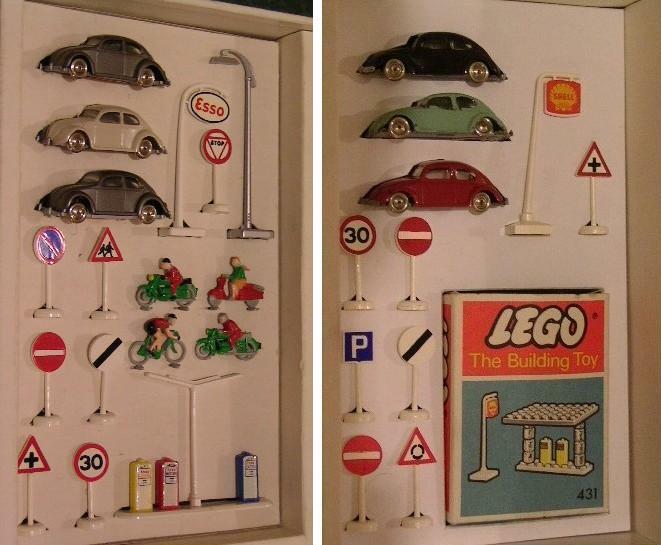 And in 1958 the flat box was introduced, where all parts were held in place by box inserts. 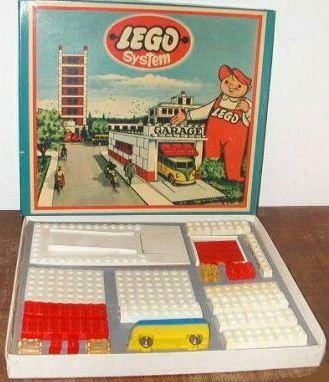 This type of box was retired in 1965, and all later sets were of the loose rectangular box variety. 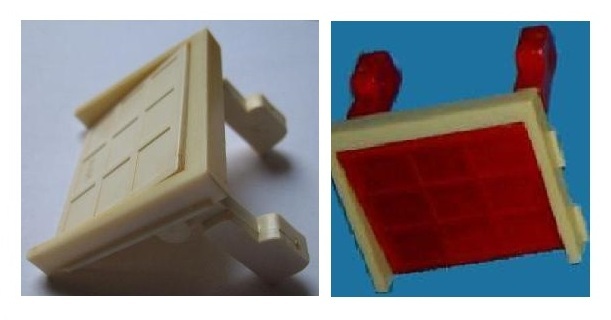 Here are the 2 types of LEGO garage door mechanisms used with slotted bricks in the 1236 version of the Garage Set. 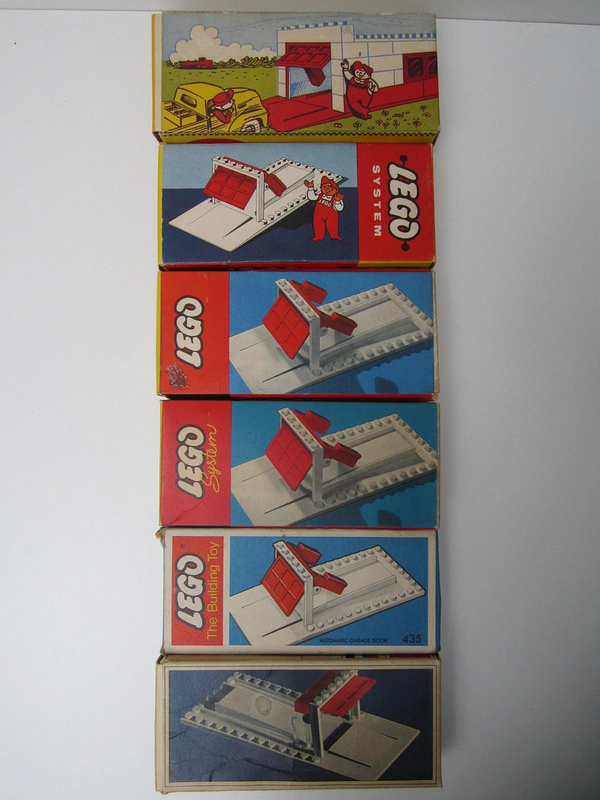 The one on the left is the 1955 type, and required 4 slotted bricks on each side (stacked on top of each other)... while the one on the right is the 1956-57 type, which required only 2 slotted bricks on each side. 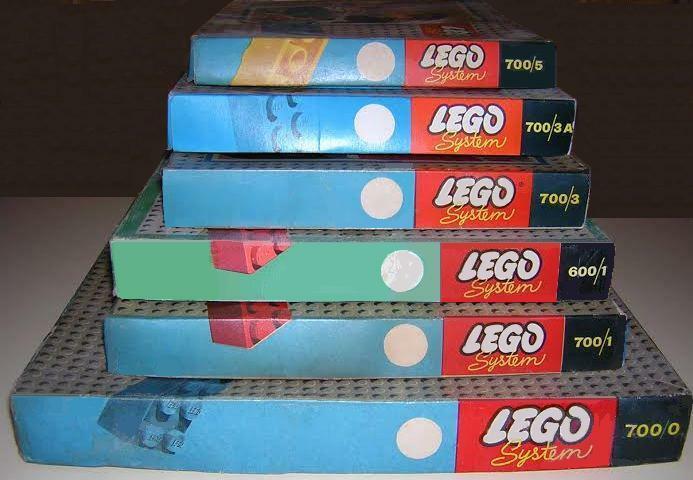 The earlier 1955 version caused the bricks to be stacked on top of each other... not a very stable build. The newer 1956 version corrected this, by allowing a staggering of bricks. These were only found in early sets of Denmark, Norway and Sweden. 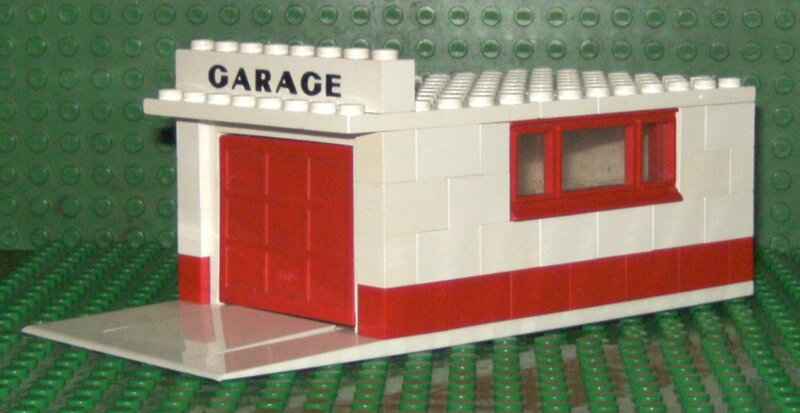 In 1956 the newer (1956-70) type garage mechanism was introduced... that had the 6 studs along the top of the garage door frame. My Unofficial Collectors Guide discusses both sets (ad nauseum), as well as many other sets that have a 10 year+ production run. So many countries... so many variations. I also break down the different parts and part variations over the years in a "Parts Chapter". @pitfall. Yes, you are correct. No sure why I thought "strong." 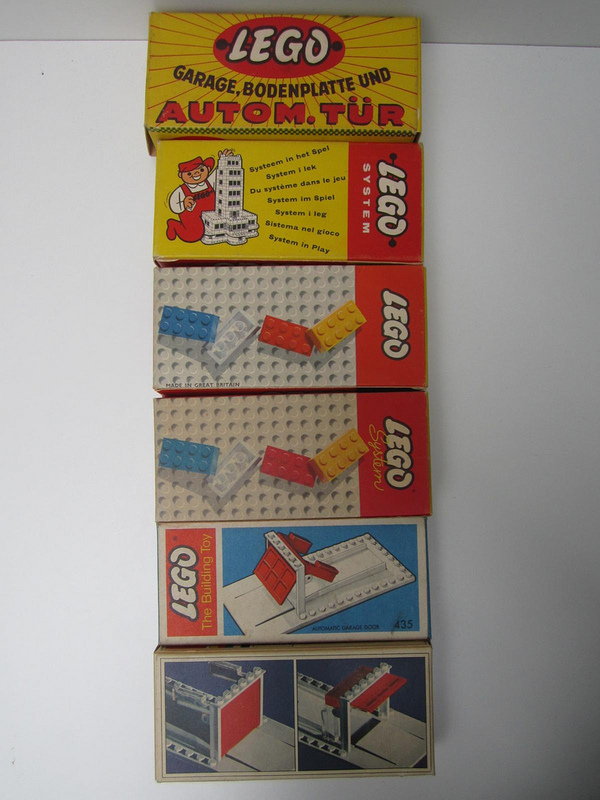 The 700/3A set was introduced in late 1953, in the new (introduced in 1953 "LEGO Mursten" box type. 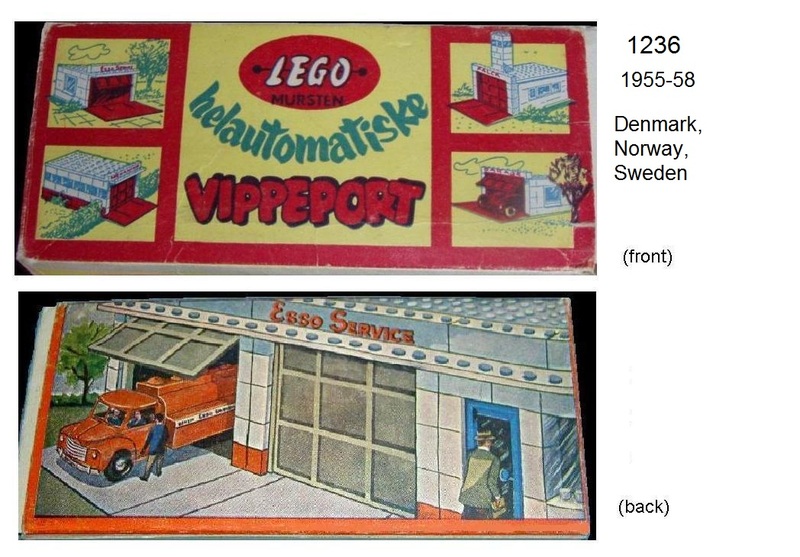 This 1953 Danish retailer announcement shows this set.... and early 4 color brick packing variation. 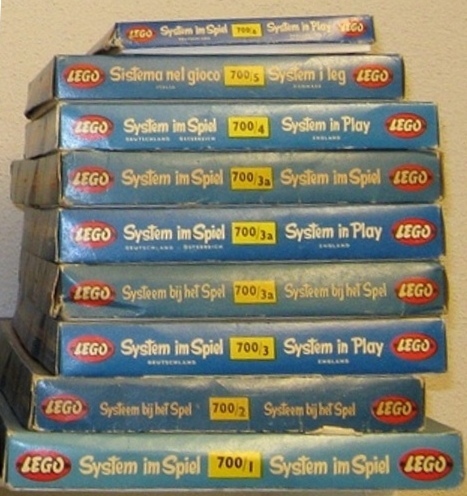 Also in this image are 3 different 700/3A sets that acquaintances of mine own. 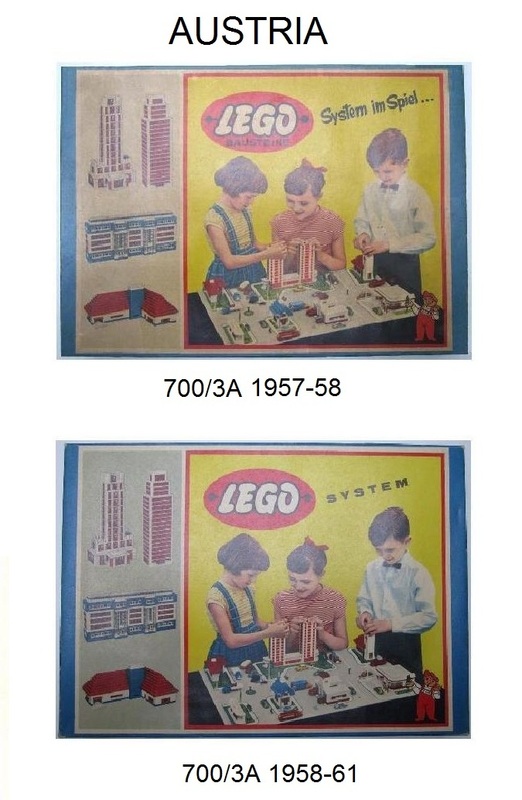 One interesting difference is the fact that the model building artwork on the announcement sheet show the artwork on the right side... but all 3 boxes I have images of show different artwork on the left side instead. 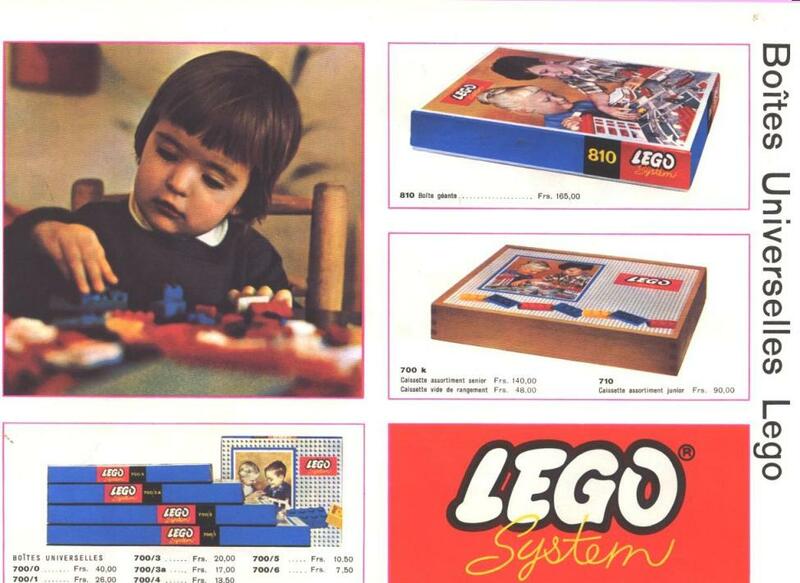 It may be that the brochure image was an early prototype mock-up box that for whatever reason, the artwork was changed before production began. 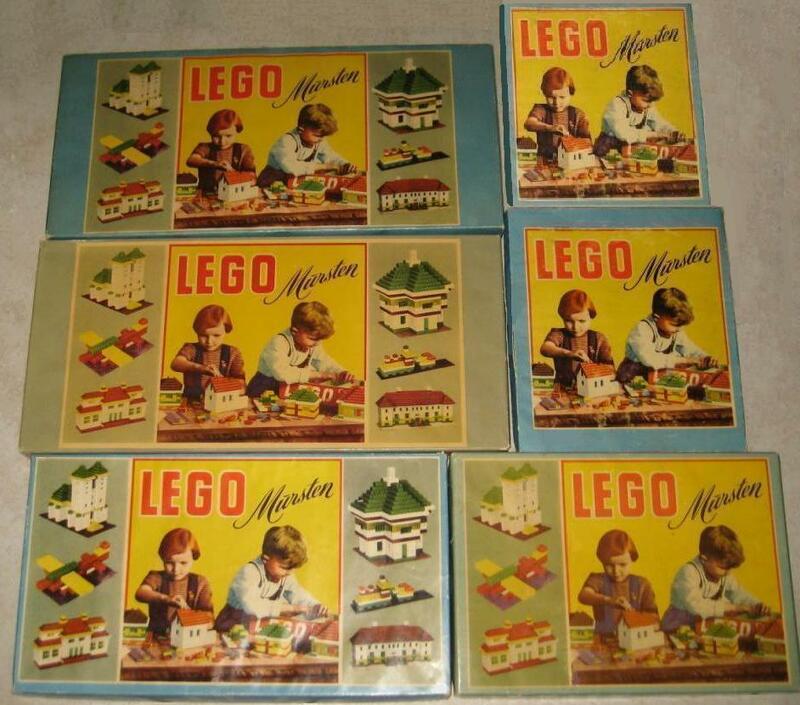 If one of those early sets with the artwork on the right side ever shows up... it would be worth considerably more than the $1500 that one of these 700/3A LEGO Mursten sets recently sold for. 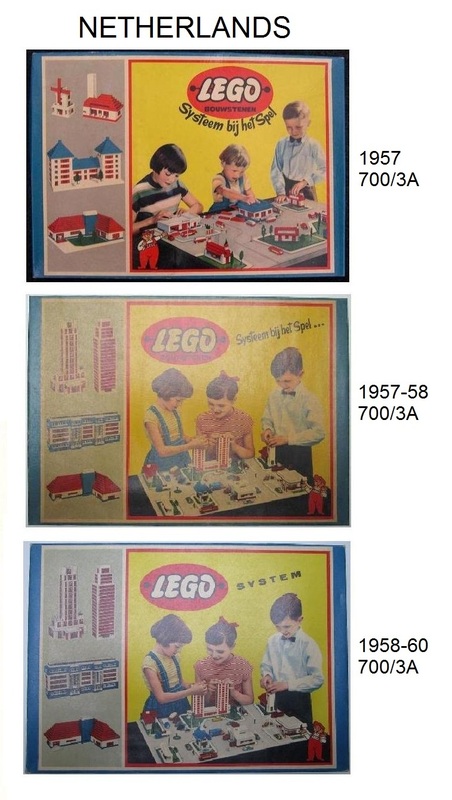 As a reference point... here are the different 1953-55 box sizes of the LEGO Mursten basic sets (from a 1954 LEGO Retailer Catalog). 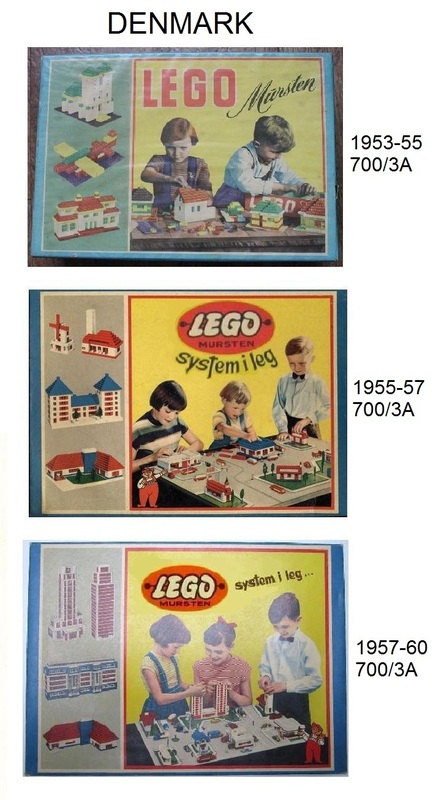 And the LEGO box styles for all basic sets (the same until 1960)... were in a local language from 1955-57 (low Town Plan scene in local language), 1957-58 (tall Town Plan scene in local language), 1958-60 (tall Town Plan scene with international "LEGO System". 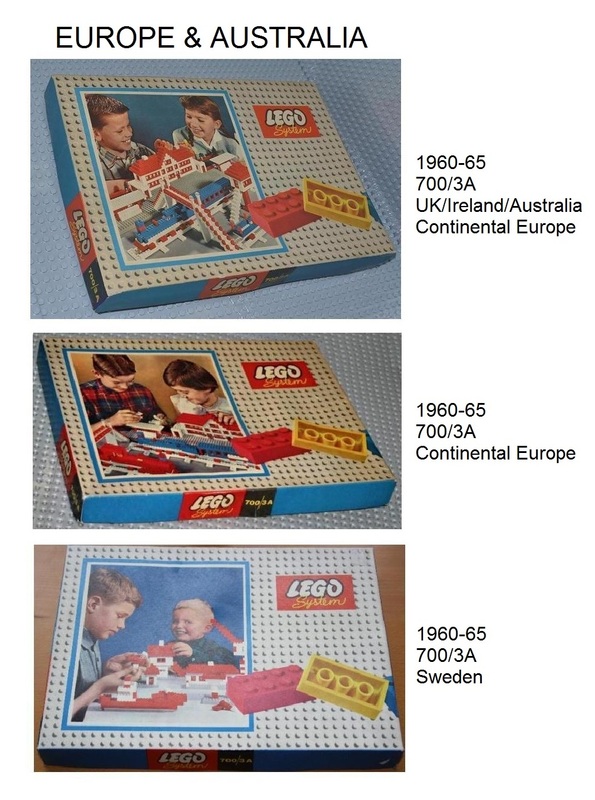 So here are the LEGO sets sold in Denmark from 1953-60.... unlike all other continental European countries... Denmark did not switch over to the international "LEGO System" in late 1958... they kept their Danish "LEGO System i leg". 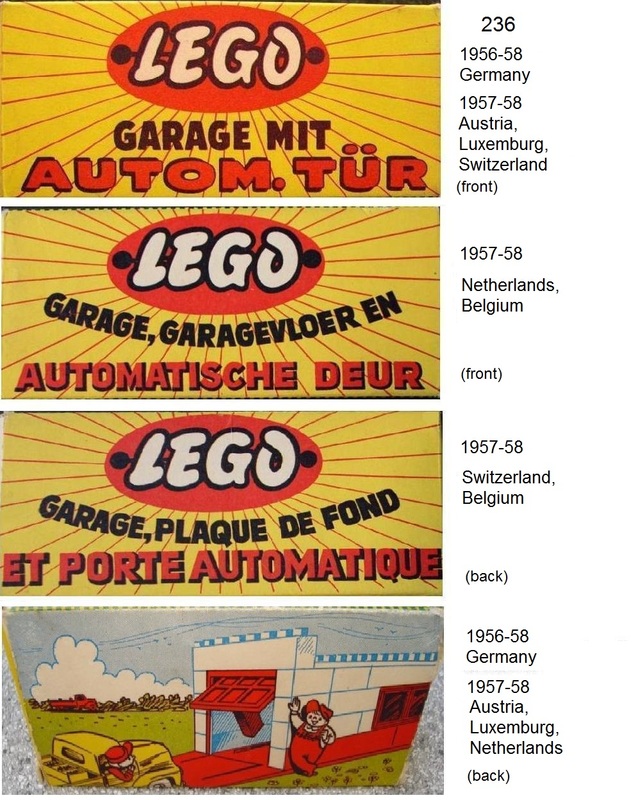 Also in late 1957 Belgium and Portugal started LEGO sales. TLG decided that things were starting to get out of hand with the different language boxes (not just the 700/3A... but the 700/1 thru 700/6 as well). And also in 1957 a larger set... the 700/0 was introduced. 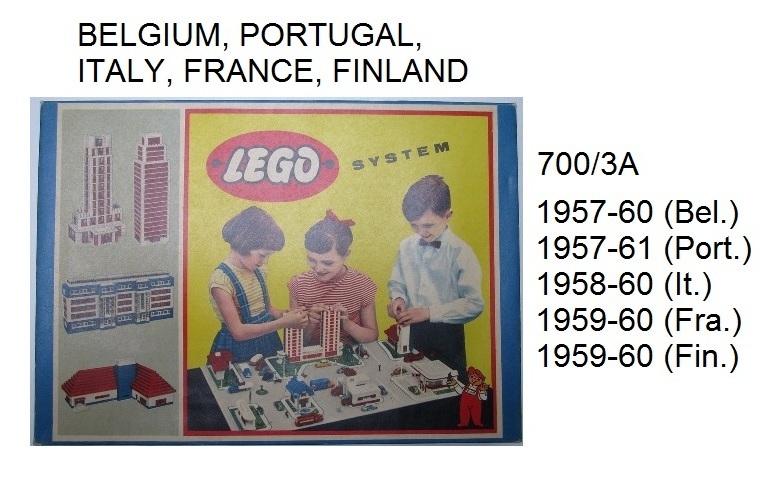 OK.... so by 1959 all of continental Europe (except Denmark and Switzerland) had the international "LEGO System" boxes for all the sets, including the 700/3A. In 1959 TLG opened an in-house Photography Department... and started producing much more varied and nicer redesigned set boxes. 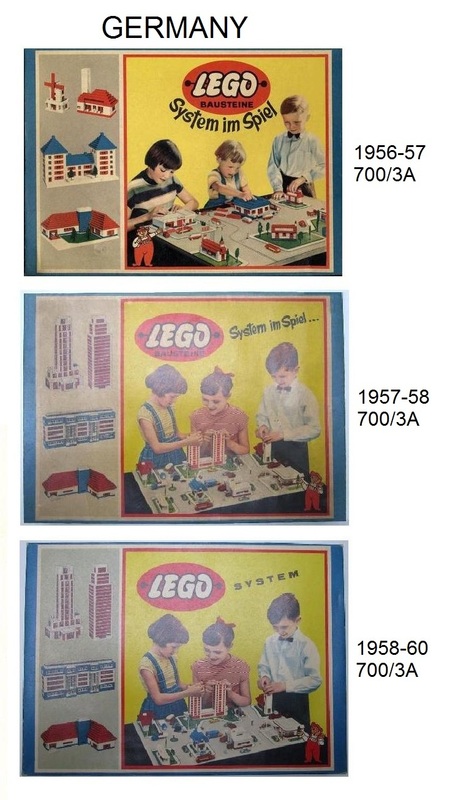 So in 1960 new box designs came out... for the larger sets there were 2 box designs (700/0, 700/1, 700/3), and for the smaller sets there was only 1 new box design (700/4, 700/5, 700/6). 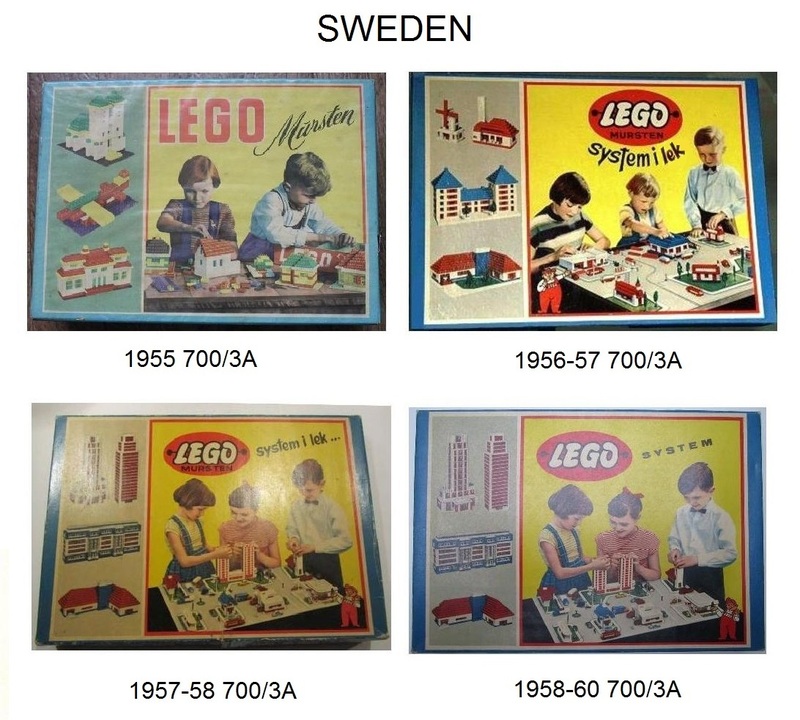 But for some odd reason there were 3 box designs introduced for the 700/3A... one of which was found in continental Europe, Britain, Ireland and Australia... the 2nd design was found only in continental Europe (many countries), and the 3rd design was only found in Sweden. 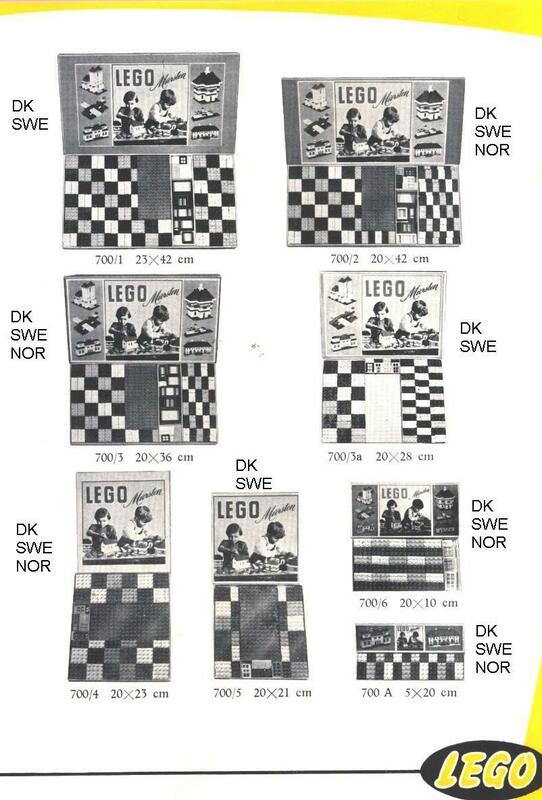 There was no rhyme or reason for the 2 designs selling interchangeably in continental Europe, and the inclusion of the 3rd design also selling in Sweden just adds to the mystery. 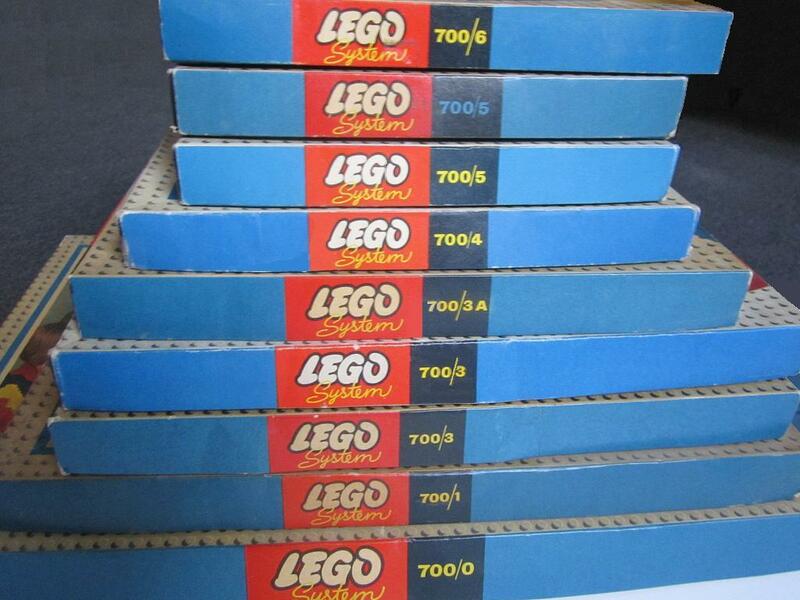 By 1965 all the 700/x basic sets were finally retired, for new sets in new box types. Thanks to so many of my LEGO collector friends from around the world, I've amassed quite a stunning collection of LEGO box images, so many that the next version of my collectors guide (free to current owners)... will have at least 500 additional awesome images! Although the sides of the boxes were blank until 1957... after 1957 the sides of the boxes were different, depending on country and box type... from 1957-60 the boxes had different writing on the sides. If the box top was in a local language... then the sides had the same language writing all around it. 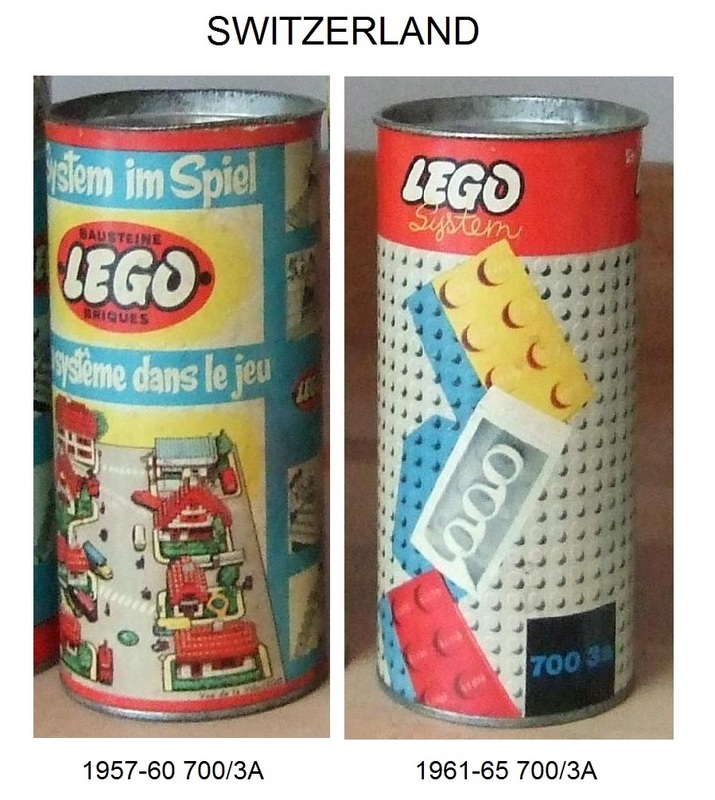 If the box top was in the international "LEGO System"... then the sides of the boxes were in about 10 different languages on the sides... even though many languages (English, French, Italian) were never found in that language on the box top. OK... and now the 1960-65 continental European basic set box sides... (blue writing dates the box to 1960-61, yellow writing dates it to 1961-65). 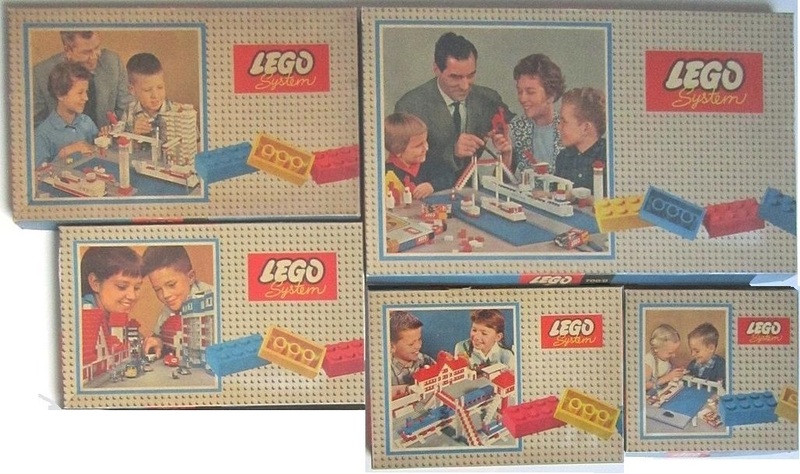 OK... since I like to go off on tangents... lets go from Chapter 5 (1953-65 LEGO Basic Sets), to Chapter 3 (1955-67 Town Plan Sets & Boards). 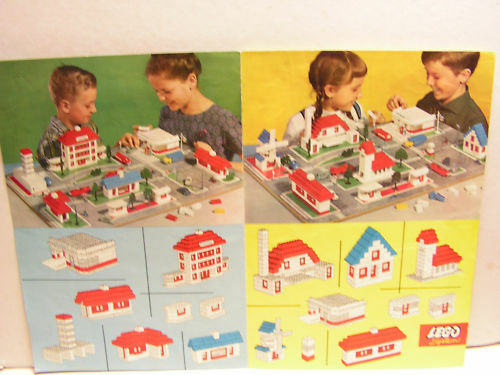 The 1961-67 810 Town Plan sets came out in 2 box designs... the one on the right (below) was sod in Britain, Ireland and Australia. 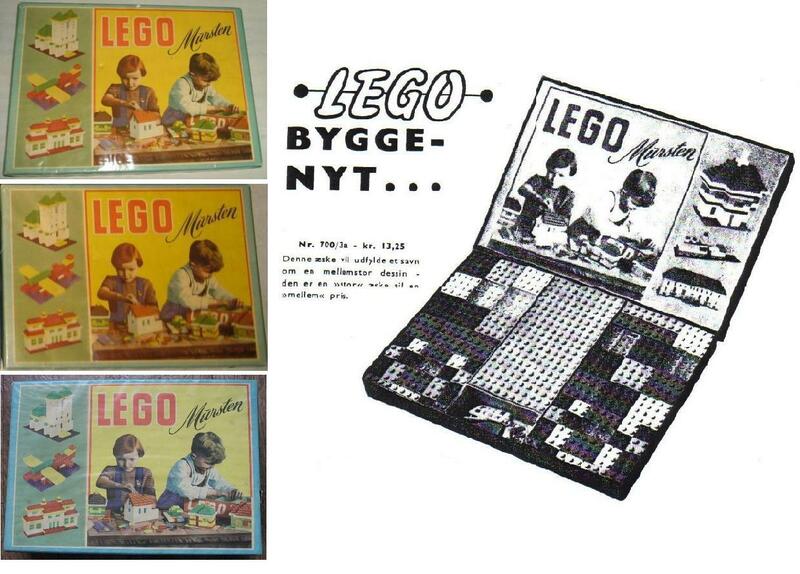 The one on the left (below) was sold in Denmark, Norway, Finland, Belgium, Switzerland, Italy France, Portugal and Japan. So the continental European 810 was sold in 9 countries, and the UK 810 was sold in 3 countries... So then why is the UK 810 version of this set 20 times as plentiful on the secondary market as the cintinental European/Japan version?? Don't really know the answer to this... except perhaps very few of the continental versions were produced and sold. I only know of 2 examples of the continental 810. 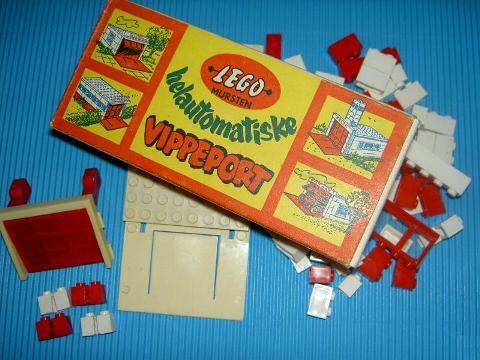 They don't even have one in the Billund Vault!! I know of the existence of about 40 of the UK versions (one Dutch collector has 6 of the UK versions). A very odd mystery!! Is that you dear? My wife can get really talkative sometimes! Just kidding @Istokg. 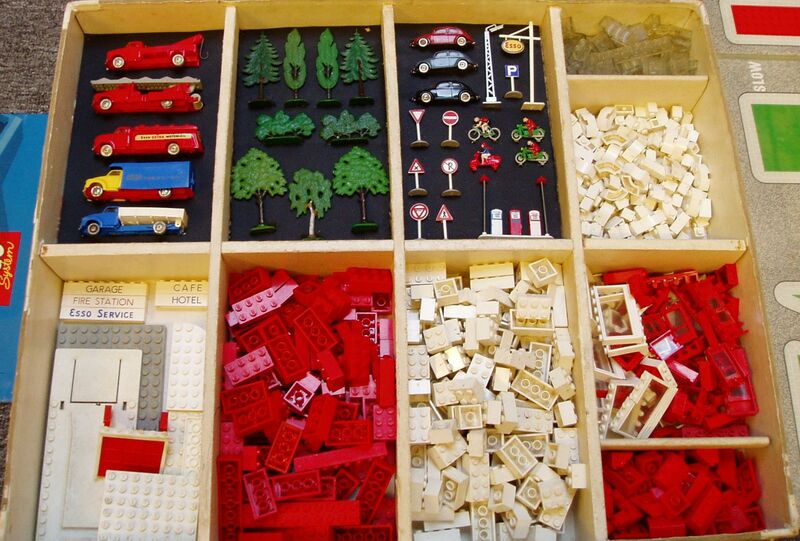 You should be the next curator of the Lego museum. Love the posts and images! 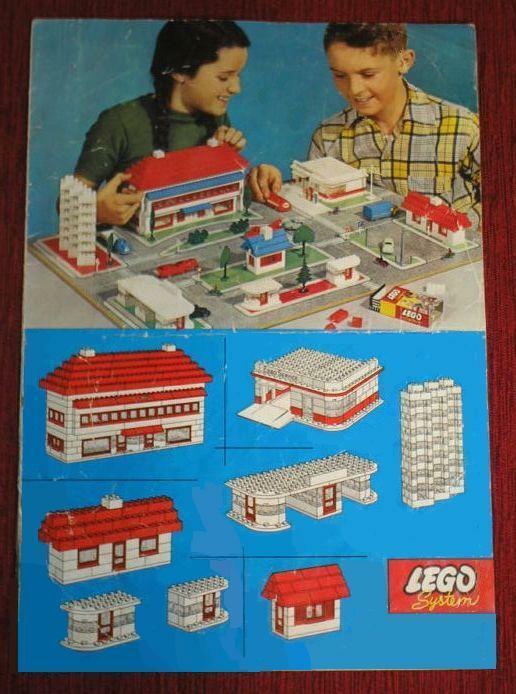 So the box top of the continental version shows a streetscape where you could NOT build what is shown on the box top (except for the service station)... since the set never came with the 1x1x2 and 1x2x1 windows shown in 2 of the buildings!! 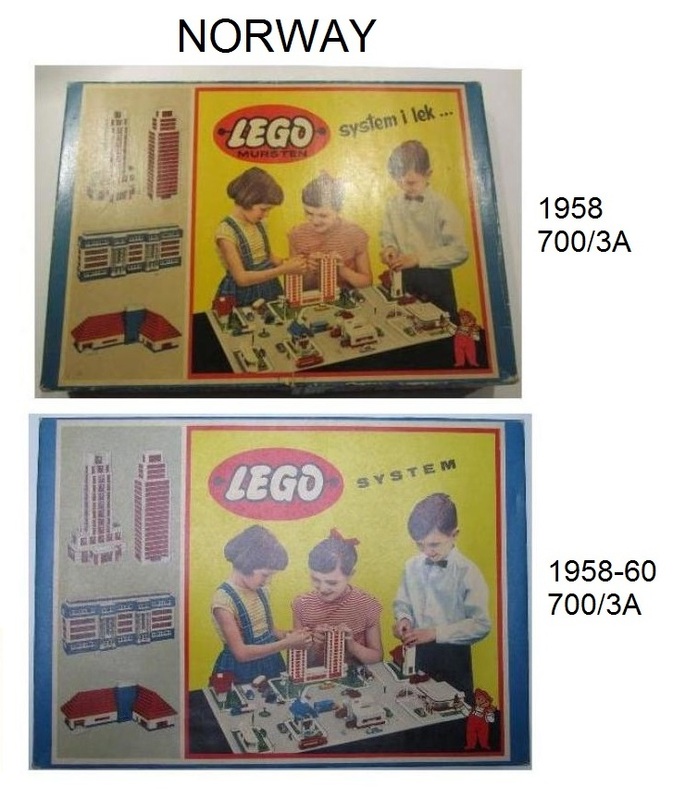 OK... let's take this tangent a bit farther.... the UK 810 came in 2 box top versions... the 1962-64 box top (right, with "LEGO System"), and the 1965-67 box top version (left, with only "LEGO"). 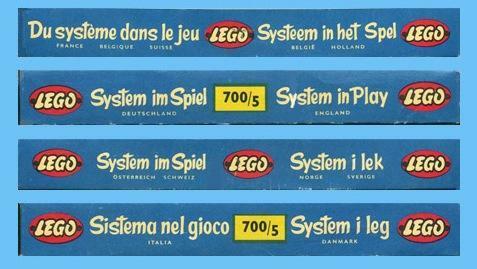 Apparently the word "System" disappeared from all UK/Ireland/Australia boxes in 1964, sets and parts packs. 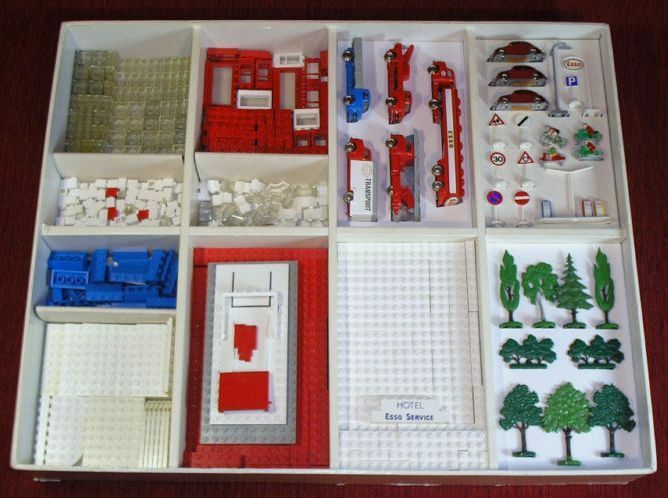 There were about 1/2 dozen different packing variations between the UK and EU version of the 810 Town Plan set. Here is an early (1962-64) EU version with Bedford 1:87 trucks, continental Town accessories, and trees/bushes with flat feet. Then there is a later (1965-67) version with Mercedes 1:87 trucks, British Town accessories, and trees bushes with hollow feet. 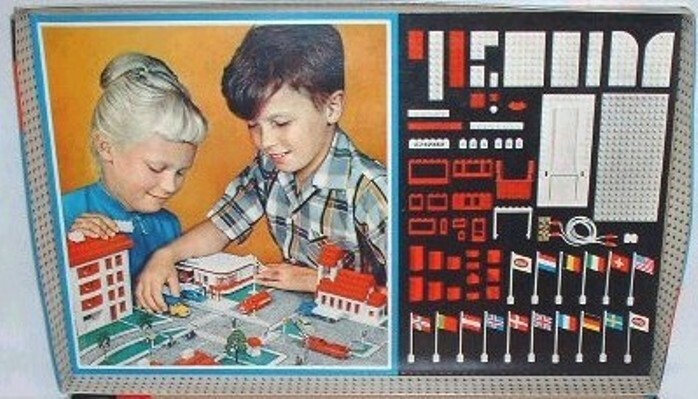 Most of continental Europe discontinued the EU 810 Town Plan in 1966. 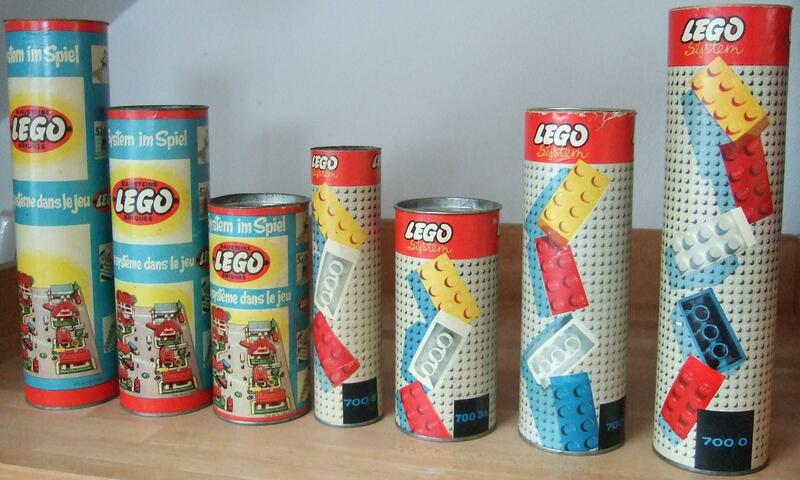 But British LEGO Ltd. must have still had a lot of boxes left over... they continued production into 1967. 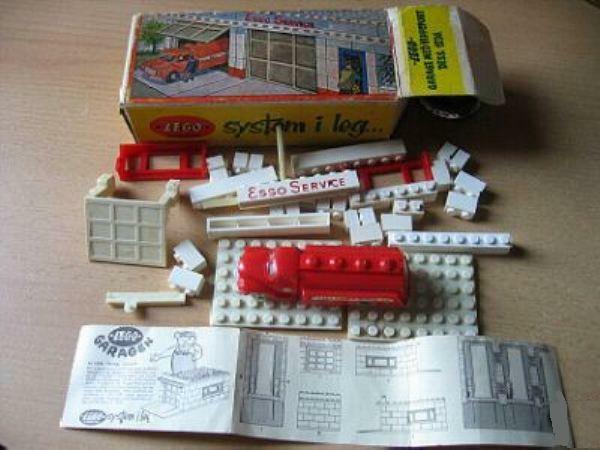 However... by 1967 British LEGO Ltd. was running out of Esso Station accessories. So what were they to do with all those leftover Town Plan boxes and boards?? 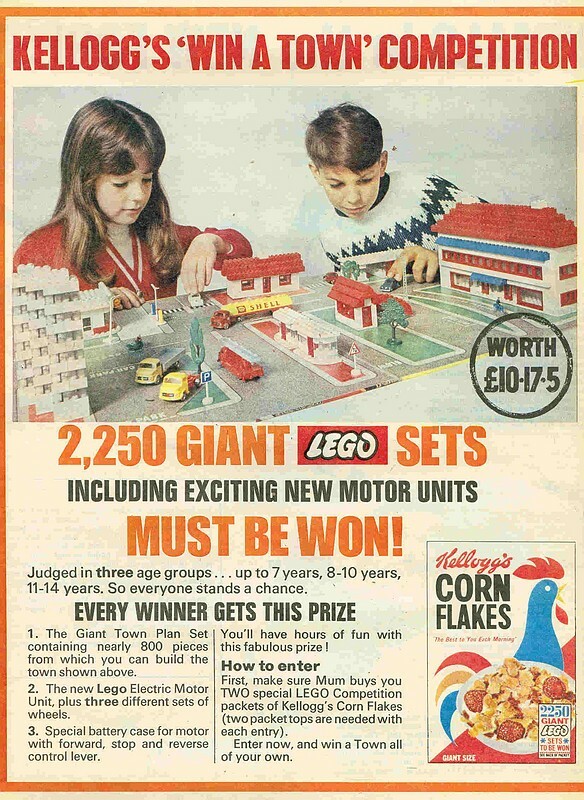 Easy enough solution.... they produced a British Kellogg's promotional set (only 2,250 sets)... which were put together with leftover Town Plan parts... but with the new (1966) Shell Service Station parts... incorporated into an Esso Station building! 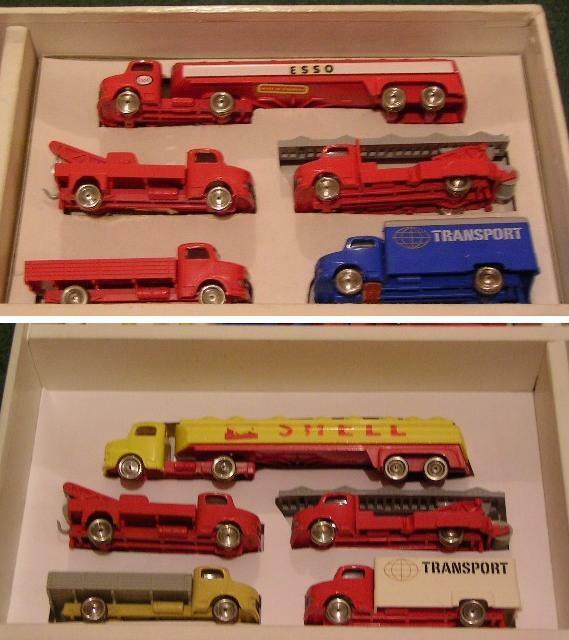 Here we see a 1967 British Kellogg's promotional LEGO brochure, the 1965-66 Esso accessories and Esso tanker truck... and 1967 Shell accessories (in a parts pack box) and Shell tanker truck. 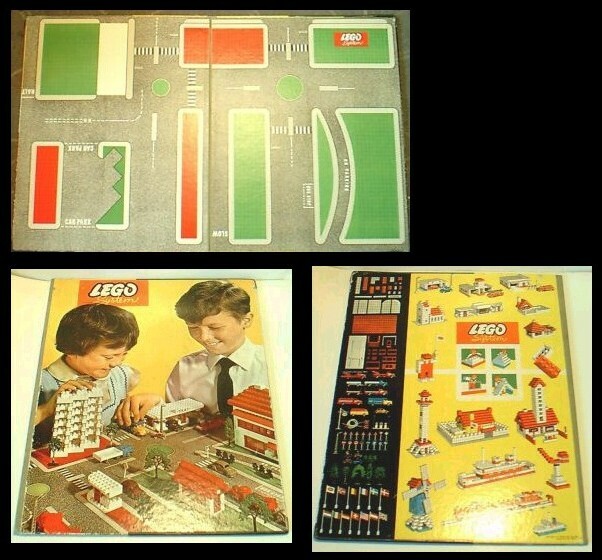 These images are from Chapter 3 (Town Plan Sets and Boards) and Chapter 16 (Promotional LEGO Sets - 1955-2000) of my LEGO Collectors Guide. 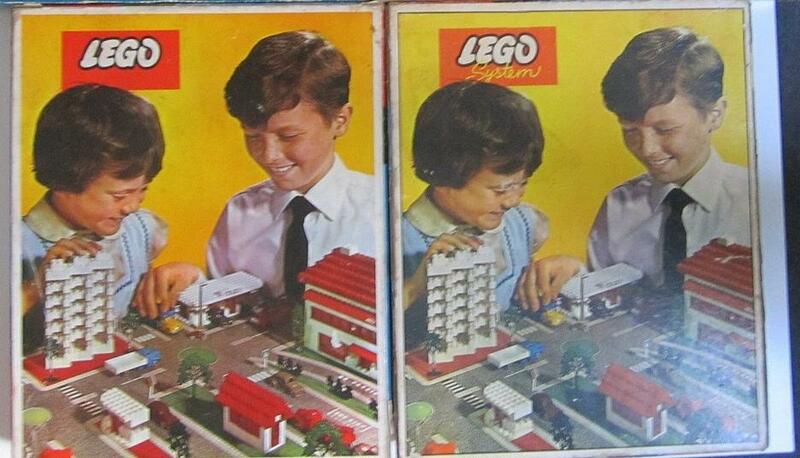 Oh... one last thing about the UK version of the 810 Town Plan sets. 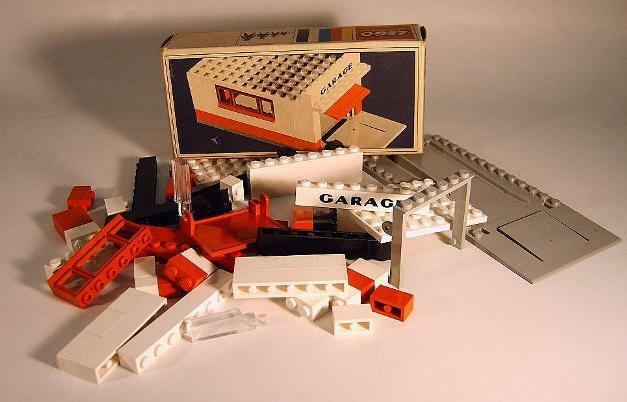 British LEGO Ltd. (a Courtauld's subsidiary) had a LEGO plant in Wrexham Wales... for production of LEGO for the British, Irish and Australian market. 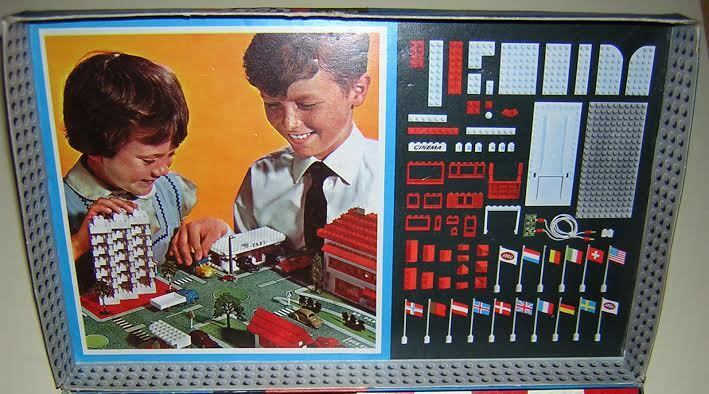 But British LEGO Ltd. did not make the 200 Town Plan Boards that were sold separately, and also were part of the UK 810 Sets. 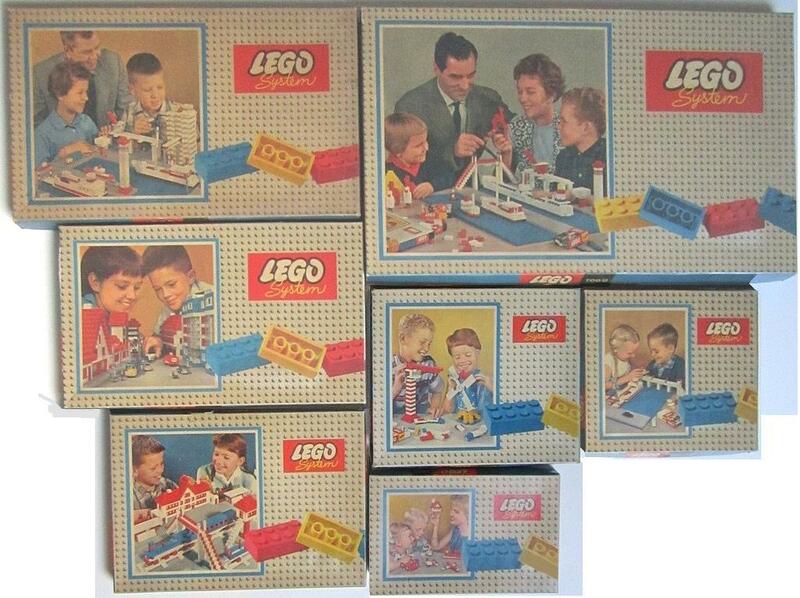 These boards were made by Waddington's... a UK game board maker... and produced for British LEGO Ltd.